In my defense the poor child has been to Las Vegas nearly a dozen times in her short life, mostly because its close and we have family there. She has never been to New York, although we talk about it quite a bit. Its clearly time to broaden her horizons. Maybe a cross-country trip is in order. I was clicking through Schemer the other day looking for new adventures; with and without the kids. One person posted "travel by car through 21 states in 40 days". While I don't have that exact wish, we do love to road trip and I plan on conquering our own United States (and Canada) before we start traveling internationally. I added that idea to my to-do list and realized that the person had posted a blog link. I clicked on over to GeekDad prepared to read about this adventure a man had with his two children. I kept reading and was quite surprised to find that a mother had written the article on GeekDad and more surprising than that; she had taken the kids on their 40 day adventure by herself (minus 2 weeks when her husband joined them). I started pouring over her blog to figure out how exactly she accomplished this feat alone. 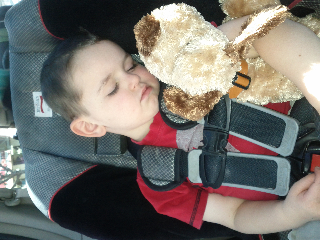 I do quite a bit of road tripping just me and the kids; but its exhausting, and boring. But since this is something I truly aspire to and Caskey just doesn't have the 40 days to be out of work I am going to start working on achieving this quest. I am quite amazed that she was able to accomplish this feat. Quite frankly I am jealous. So in order to make myself feel better I enumerated the ways she was able to make it work that will not work for me. 1. She only has 2 children and they are aged 10 and 7. That means they potty, bathe and carry their own bags. They are also far more capable of understanding "hold on" and "pee now, the next rest stop is in 3 hours". 2. Her and the kids are able to squeeze into one hotel room. 3. She has tons of family and friends through out her route which enabled her to save on hotels and a place to land for a few days (including laundry facilities). But I am not about to let the size of our family or age range stop us. But a few minor things will need to happen to make us successful. The kids needs to grow up a little. Traveling for that long with 2 really little kids is a recipe for disaster. Perhaps when Eleanor is 3 years old we can tackle a really long road trip, until then we will stay a 2 day drive from home. The Monster Van needs some upgrades. This week we took a 3 day trip to Las Vegas. We traveled 'light', no swim gear or winter gear. But even so I had a large over-filled shoulder bag, toiletry bag, play pen, box of toys and books, my purse and my laptop. I can't imagine having to lug around luggage for 10 days for 7 people - that is 70 outfits! -My solution to this is installing a dresser in the trunk of the Monster Van. I would then put all the clean clothes in the dresser (drawers will be much easier to organize and easier to find things). Then each night I arrive at a hotel I will gather the clothes we will need for the duration of our stay (one or two nights) and put them in a small duffle bag. I was thinking I need a drawer dedicated solely to food as well. I like to have healthy snacks on hand, but don't want to be shopping every day. -We will also need better lighting in the van so I can root around for all the clothes and dropped toys. - Entertainment for me. It is incredibly boring and tiring for me to drive many miles by myself. Although we have separate entertainment systems for the front and back of the van I don't have any media I can use. Its great when I can tune into talk radio, but most of the time its static or I am distracted fiddling with the radio. I have my favorite music, but I have memorized the playlist and it puts me to sleep. I wonder if I can save books on tape to a thumb drive. I bet a good book would make the corn fields of Kansas more appealing. - A plan! I am getting started on that now, thanks to Google Maps. I will be mapping all of my must-see sights. Then I will be able to group them into one or two or four different trips. +Caskey Dickson here is your Monster Van to do list. 1. What it really means to live in the middle of nowhere as we were stuck in traffic between Baker, CA and Primm, NV. The kids wanted to just stop and get out of the car. So I asked them, "where?" They were well behaved after that but understandably tired of being cooped up. 2. We saw really really big tires today on the back of a flat bed truck. They were seriously bigger than my car and there were 6 of them. I wonder what they were for? 3. The children got to see and thank service men and women traveling over the holidays. I tell them that there are people who don't get to be with their families at Christmas, but they actually got to see those men and women and thank them. I hope this lesson and reminder stays with them for the rest of their lives. 4. Connor learned to hand wash socks. He forgot to pack his so I taught him to use a bar of soap and scrub them clean. They are now hanging over the shower rod drying. 5. Last but not least, to not be afraid of adventure. We spent very little time packing and even less planning. We jumped in the car sans Daddy (who has a hard deadline at work) and drove off for Las Vegas. Not sure what's on the agenda, but we love adventure and we love our family. We will get a little of both over the next 3 days. But its not quite what you think. I hate losing pieces and parts of things. It drives me crazy. But darling Eleanor, like the 4 siblings before her, is going through the snag and drop phase. She finds something that grabs her attention, carries it through the house and drops it randomly. I am missing quite a few containers of carmex, wii motes, tv remotes and most recently our Little People Mary and Jesus. 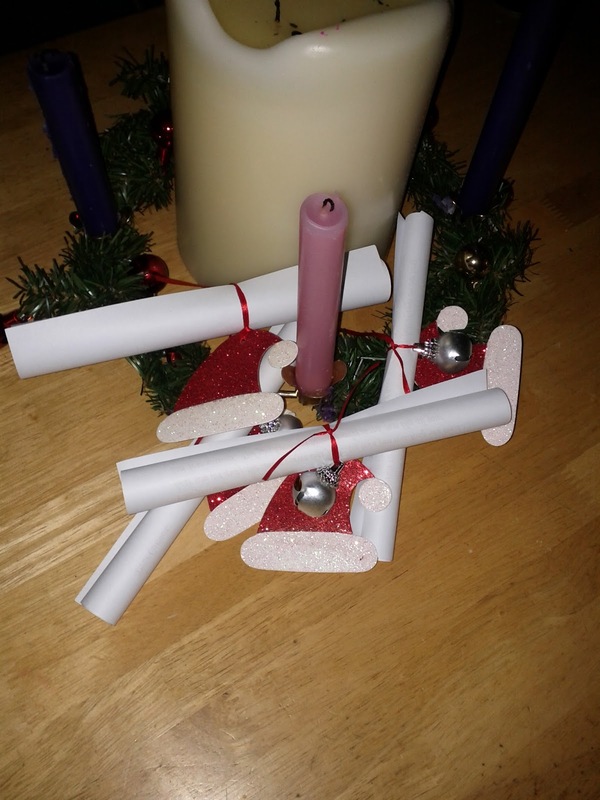 I thought it would be great for the kids to really play with and enjoy and remember the true meaning of Christmas. What it turned into was me chasing down the angel and 3 wise men every few minutes. But then Mary and Jesus went missing. For 2 weeks. I cajoled the kids into helping me look. No luck. Then I told them if we can't find Jesus then we can't celebrate his birthday with presents. They didn't believe that one at all. So, yesterday as we were walking out the door to spend the kids Christmas money on Skylanders I put a bounty on their head; $5 each. That is half a Skylander! I gave a few hints; under the couch, next to Alexander's bed, under William's bed. Connor was victorious. He had found Jesus. I happily gave him $5 to spend on Skylanders, because let's be honest. I was just going to buy them for him anyway. This way he feels he earned the money and spent it on his own. Christmas hasn't gone as planned this year. With the winds, a husband and wife weekend and a very busy end of quarter we didn't get things Christmassy and decorated as soon as I would have liked. We finally got our tree and stockings and decorations up in the house. It was a lot of fun listening to the kids ooh and aah over the ornaments and exclaim, "I remember this one" and "Where is my blue one?". Once the house was decorated Santa made is annual visit and delivered letters of encouragement to the children. They awoke to nicely wrapped letters on the kitchen table with magical un-melting snow sprinkled all over (yeah, thanks for the clean up Santa). Lainy Ann was so excited to find the letters that she woke up the two little boys. There was squealing and jingling all morning long. Lainy Ann decided she HAD to take her letter to school, so we let her. We let our 8 1/2 year old daughter take her Santa letter to show her 4th grade friends. We had to. At the end of the day I received this email from a parent I don't know, but she apparently knows us. This morning, your daughter told some of her classmates that Santa paid her home a visit. Despite some doubts from some of her classmates, she was confident enough that she told them, "I have proof!" She quickly showed her letter from Santa to her friends. With red ink and all, her friends questioned her less. When the assembly was over, she excitedly walked back to class with strong pride and believe of Santa on her mind. I think it's really nice to see young kids with strong Christmas spirit. I was so touched by Lainy Ann's strong believe that I mentioned the story to my pest control guy whom happened to come by today. In return, he shared his story with me. He said one time he visited a friend with two young daughters to drop off some gifts at their house. The girls enthusiastically told him that Santa gave them two bikes. They too were so certain that they were from Santa that they proudly pointed the "reindeer paw prints" on their bikes to him. After the girls walked away, he went up to his friend and said, "You know, those are rat prints. You need to put some rat traps in your garage." In any case, hope you guys have a Merry Christmas and a Happy New Year! I took away many things from this email. Number 1, my daughter is a strong, confidant young woman who does not allow peer pressure to sway her opinion and belief. That will serve her well in the rest of her life. Number 2, our Christmas spirit has once again touched someone outside of our family. This boy is trouble. Truly. You see that grin and adorableness. He knows it too. 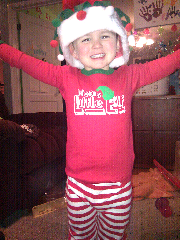 After we made a fuss about how cute he looked in his Christmas jammies he wore them all night with his Santa hat. Even Eleanor noticed all the attention he was getting. After Alexander wandered off she crawled into my lap so I wouldn't forget about her cuteness. I know William is adorable. We like him too. But please don't steal my child. I know you think you are helping me by walking him to my car. But walking him to my car and putting him in your car and driving him to our house WITHOUT TELLING ME is not the same. Its kidnapping. You owe me, my family and most importantly +Lainy Cullen an apology. Thanks for giving us all a few more gray hairs. Also, thanks for reminding me to have another 'stranger danger' talk with my son. Yeah, this is not what I meant when I said I wanted more Parental Adventures. *sigh* This was my Google+ status today. I get a panicked text from Aunt Lainy about not being able to find William and that Jordan's mom had taken him to our home. It took me a few seconds to place Jordan's mom since we are not friends. I don't know her last name and we have not exchanged phone numbers. After about 20 minutes it was sorted out. The school was able to call her on her cell phone and tell her to bring William back. *sigh* Just when I was starting to get comfortable with leaving the kids with babysitters. Alexander had his Robbin's Nest Holiday Festival this past weekend. It was hard going this year and I feel bad for that. First of all Alexander missed 2 days of school (and practice) right before the concert. And since we only have one child at Robbin's Nest this year it kind of feels weird to bring all 5 kids along for this, especially when the crafts and activities are definitely for the younger kids. Even Connor did a bit of whining in the morning about having to go. But I was bound and determined to treat him like child #1 instead of #4 and be excited about his activities. Even Grandma Lou came to watch him. He sang all the regular songs; Chubby Little Snowman, Up on the Housetop, Jingle Bells. Then we made the rounds as the children made Reindeer Food (dry cereal and raisins), necklaces, paper hats, and ornaments. My mom remarked, "Boy, it sure is nice to be here this year. The kids are really growing up." And she is right. There was a lot less hovering and gently steering this year. My mom, Caskey and I chatted outside the classroom and watched Eleanor toddle around while the other four crafted. Connor and Lainy Ann certainly don't need any help and William is on his way to independence as well. Lainy Ann and the teachers were there to assist Alexander in tying knots in necklaces. The kids had a great time and I am enjoying watching the fun rather than having to make the fun. I do wish I had gotten a picture of all 5 of them together. I have definitely noticed myself slacking in that department as the children get older. We spend a lot of time talking about all the adventures the kids participate in. But I realized that Adventure isn't just for them. This weekend Caskey and I are celebrating our 10 year anniversary, out of town, for 2 nights, with no kids. That in itself is an adventure. I get a sick feeling in my stomach every time I am going to be away from my kids. So I spent most of the week ignoring the fact that we would be leaving. I spent the time doing Christmas chores and packing the kids. Well, that really showed when I discovered the night before we were going away that I had nothing to wear. Oops. Our first adventure was to go shopping. I was looking for something fashionable, easy to wear, warm and comfortable. I spent 2 hours shopping, and then failing. Caskey felt bad too, he was sorry he couldn't be more helpful in finding the right clothes. The next morning we got up early (or normal for those parenting types) and got all the children readied for the Robbin's Nest Holiday Festival. But once the kids had made all of their crafts and sung their songs we were outta-there! We dropped the kids at Grandma Lou's house and set off on our next adventure. We went to attend Accomplice Hollywood. I would like to tell you about all the fun and antics and laughter and my sore feet. But I was sworn to secrecy. So let me tell you this. Get your closest and funest friends together and go. Its worth it. Wear tennis shoes and be prepared to have fun. Its kind of like a mystery train ride but walking and in Hollywood. Its part scavenger hunt and part live-theater. Its 100% fun! I want to go to NYC now for the East Coast version. Then we drove to SLS Hotel where we would be staying the night. I did little to no research on the hotel since it was where the Google Party was being held. The goal was to be able to have lots of fun and not have to drive home. That part worked, but the hotel. 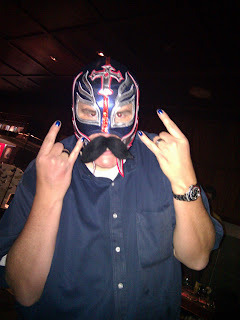 . . . . while it wasn't gross or bad it just wasn't my style. It was designer, which is the nicest word I can think of using. Every surface was mirrored or reflective, but with the low lighting I just felt like someone was following me around. Plus the room was small and poorly arranged so Caskey and I kept bumping into each other. Just strange over all. It was not functional - finding a convenient outlet was a challenge. Then there was the 2nd mirrored door into the bathroom. I guess it was so you could brush your teeth and look at the person in bed?! You couldn't see the tv from the bathroom, so I'm not sure why there was a sliding door you couldn't use. Oh well, it was only one night and the bed was comfortable. Sunday night was a concert. I don't normally go to concerts. I'm a little ADD. I feel like music is something you do in addition to something else; music while driving, music while doing housework, music while dressing. Sitting and watching music is boring for me. So I was worried I would feel that way again and my Mother's Day Tickets would be a big waste of money. Well, nothing could be farther from the truth. 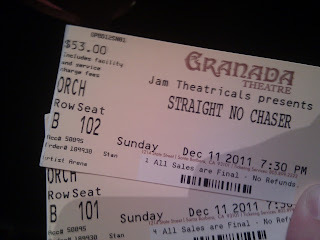 Straight No Chaser was a fabulously entertaining group. They are an accapella group who have some original arrangements, but they also cover older songs, but switch it up. Kind of like dueling singers, plus bad dancing. It helps that they are cuties too! Caskey was not looking forward to 2 1/2 hours of Christmas music, but he even got into it as they covered Michael Jackson and Cello Green. Our hotel the 2nd night was more my speed. Lots of nice dry wall, a regular bathtub and toilet. Lamps on every night stand with a plug. 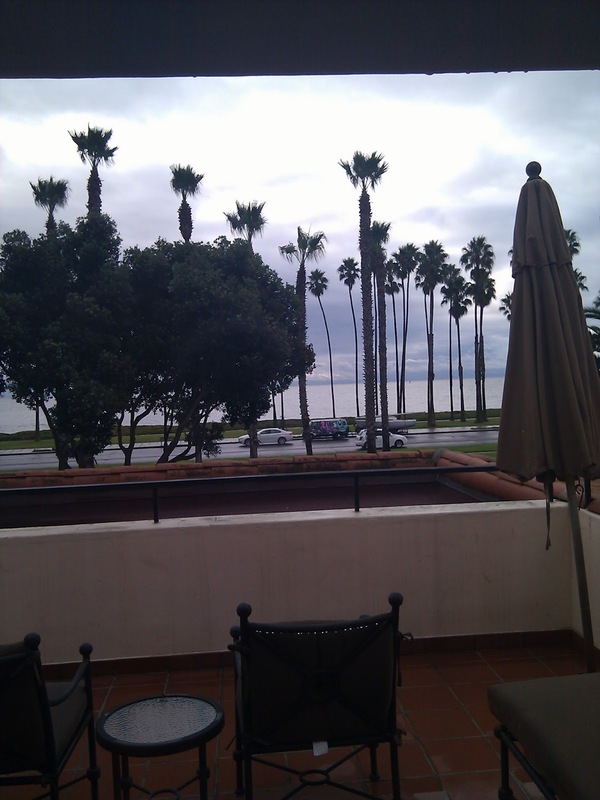 The bonus is the balcony with a view of the ocean. Beautiful. *I* had set the heat before we left the room (something that is not normally allowed) and we came back to a sweltering room. It was literally 80* in the room (which is why I'm not allowed to touch the heat). So we opened the balcony doors and closed the blinds and went to bed. We could hear the waves from our bed. It was lovely and relaxing and so quiet. I am rarely around that kind of silence. Today is our last planned day of adventure. We were going to attend a tv show taping, but I am feeling anxious and nervous because Lainy Ann has a science test I want to help her study for. But its only fitting that I cut our 10 year anniversary short since I cut our honeymoon short as well. I miss my kids when I'm not with them. I think we will go back early, maybe see a movie, get a Christmas Tree and study for the science test. Not exactly romantic, but definitely a parental adventure.